Following on from my earlier post on the “The NEW B2B Buying Process and Sales Pipeline: Internet Marketing” its always worth assessing on a regular basis, how to improve conversion from one stage of the Sales Pipeline to the next. How detailed your Sales Pipeline is will depend on many things e.g. industry / market / product or service selling process, the size of your business and organization etc, but the number of stages should be limited to no more than 5 or 6 stages. The Sales Pipeline is the core process within Customer Relationship Management system, CRM will only have value when the Sales Management and Sales Culture maintains up to date information both qualitative and quantitative, and everyone has adopted and is committed to the conversion process and metrics as defined. 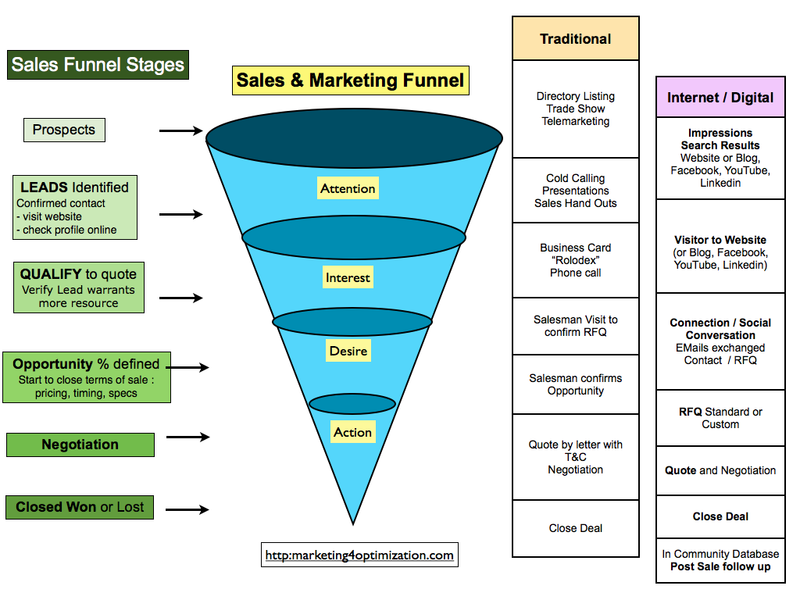 Sales Pipeline Stages and using Internet / Digital Marketing to improve conversion rate. Whether you would describe your business sales tracking system as the Traditional or Digital approach the key to a profitable sales process is Qualifying and Verifying the leads accurately, particularly deciding when to “let go”. The sales person’s ego can find this part of the sales pipeline the most difficult. Understanding the Sales Pipeline process and the importance of Qualifying and Verifying the leads accurately is critical for all size and types of businesses to avoid waste of company resources particularly customer service, quoting and planning.